Summary: Learn why sputter deposition provides benefits over other systems. A sputter deposition system is a tool that utilizes physical vapor deposition to allow for a thin film to be placed onto a substrate. Sputtering usually involves argon plasma for it to be effective. One example of sputter deposition is during the fabrication of CD’s and DVD’s. A layer of aluminum is coated on the disc itself which is the end result of sputtering. Here are some advantages of sputter deposition that should be noted. 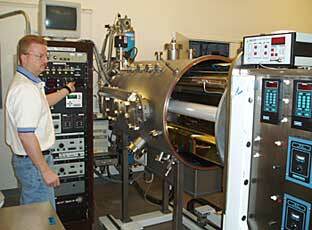 Sputtering is often used in the semiconducting industry. Why? Because integrated circuit processing requires thin films to be placed over it. This enhances not only the quality but also depends on the system to produce so it can fully function. For optical applications, antireflection coatings are done through sputtering because of the low temperatures that it requires. It’s an ideal method for transistors that need a deposition of contact metal. Finally, one of the most common and familiar applications of sputter deposition is on window assemblies. Through the process of sputtering, low-emissivity coatings are placed on the panes which are then prepped and ready for distribution. Using a sputter deposition system is advantageous over other systems – thermal evaporation system – because the deposited films have the same composition as the source material. When it comes to using a thermal evaporation system, one component of the source may have a high vapor pressure, therefore varying the levels of composition. Sputter deposition is a common, and cost-efficient, method that is continuously being advanced through research and development. With its advantages over other deposition tools like a thermal or evaporation vacuum system, one can provide an invariably clean film as a result.